Disclaimer: This is not a photo of my yard. I was lucky to stumble upon a yard with these two signs side by side, because these are the two people I recommend you vote for in the upcoming City Commission race. I’d be happy to explain why. First off, Mike Motsenbacher has a consistent record as a fiscal conservative, unlike anyone on our current city commission. He’s been involved with conservative activist groups in town as long as I’ve known him, he’s got business experience as well, and I just plain like him. You and I can trust him to be prudent in his decision making and not share the same fetishes as the current commissioners. I want to thank all of you for your varying levels of support, influence, council and inspiration leading up to this last week of the Bismarck City Commission Election. I know not all of you a Bismarck residents but thank you anyway. If you are a resident, I encourage you to vote or stop by the City-County building and turn in an absentee ballot if you are not able to vote on Tuesday, June 10th. This election is about choosing a city commission that reflects your values and values your input. I hope I have shown myself capable of doing so and deserving of your support. I strongly encourage you to watch the League of Women Voters forum on Dakota Community Access or online at freetv.org. I believe Government should be transparent: The public should be informed and a genuine part of the process both within the Tom Baker meeting room and before the issues gets there. People should have access to information and they should know their input into the process has meaning and influence. As Citizens in public meeting and forums. People engaged in the process should be treated with dignity, sincerity and respect. Once elected you still need to honor the will of your constituents, both those who supported you and those who did not since you represent them all. Economic growth and efficiency are highly desirable community characteristics: I have taught economics at both the under graduate and graduate levels for over 25 years. Including the principles of economics into public decision making will make for efficient and logical decisions for both the short and long term viability of our community infrastructure as well as business environment. Infrastructure to support growth. How and where we plan it, scalability, cost and liability. Public Finance. Government provides services necessary to our safety, security, business and social networks, education, and health. How much service is provided must be balanced with the cost and how we pay for it. Public spending is not synonymous with public investment and we need to assure the public that when we do responsibly spend their tax dollars the services and benefits are necessary and desirable. Existing and future investments must be sustainable from a fiscal perspective. Focus on the future rather than reactionary spending. EX: The Civic Center expansion was denied at the polls, yet the existing Commission voted to spend ~10-15% less on a revised plan. Paraphrasing the City Commissioners rationalized this as “…they voted against the higher cost expansion, not the new proposal…”. Subsequently when the public reacted the Commissioners voted to do a study regarding future Civic-events Center locations, expansion and needs. This was either the cart before the horse (study first then spend based on an informed decision) or a disingenuous attempt to quell the public outcry with no intent to change course. In either case the public will was discounted. If the process were inclusive of a long-term community vision the study would have preceded the decision and the urgency to begin construction would not have overridden an open public process nor blatantly disregarded public opinion. A focus on planning and vision for the future will aid in efficient long-term spending to build and maintain an adequate community infrastructure. Public safety and health: As our community grows, demands on police, fire and public health resources will increase. These services are vital to an attractive and vibrant social and business culture. The culture and economic opportunities in Bismarck are what makes our city attractive and provides the backdrop for growth. I hope I have your support at the polls on Tuesday! The Civic Center thing struck a chord with me. 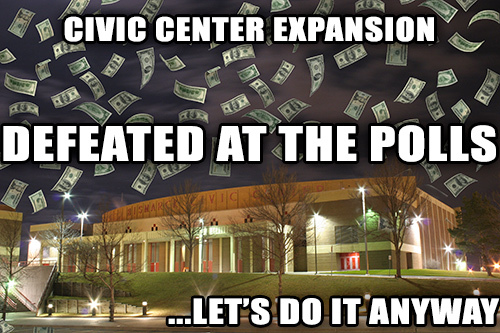 I’m a Civic Center employee, but I was firmly against pouring more taxpayer money into the expansion. I outlined my reasons in a post here. So were most of the rest of you. That was not enough to prevent our commissioners and mayor from diverting taxpayer moneys from elsewhere and proceeding anyway. For that reason, they need to go. Their cavalier attitude and fetish for downtown, “green space”, and the Civic Center expansion need to be their ticket out of office. Duane Pool gets it. I may have some other research to pass along regarding the vote this week (if you early vote) and next. 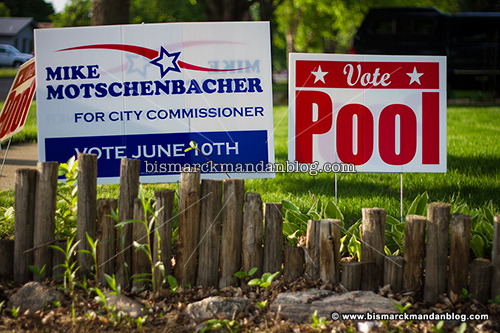 Stay tuned, and vote Pool and Motsenbacher for City Commish!